In the previous three installments of Getting Started with HTML I gave you a brief history of HTML, showed you how to make a very basic web page, and showed you how to place structural elements, tags, and headers into your web page. If you missed any of those you can always take a look at them here: HTML Tutorial Part 1, HTML Tutorial Part 2, HTML Tutorial Part3. To begin, let’s once again open the web page that we’ve been working on in the previous blogs. For this final installment of Getting Started with HTML, I’ll show you how to add some more content elements as well as pictures. Let’s get started with adding some more content elements into your page. Go ahead and save your web page now and open it up in your browser to see how the footer looks. You should notice that most browsers render the address in italic and even though you used multiple lines in your notepad the address will run together on a single line. Although having your address on a single line is fine, there are ways to separate your address so that it doesn’t look like it all blends together. To do that we’ll add a bullet symbol at the end of each line. 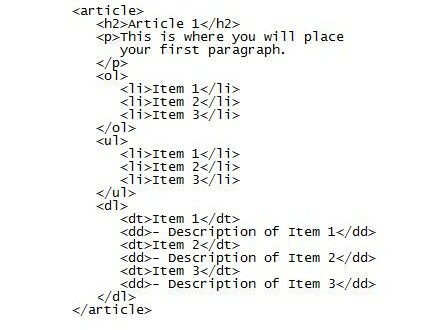 To do that you are going to add the symbol &bull; to the end of each line in the address section. Save after doing this and refresh your browser. The information in the footer section is now separated by bullets and is easier to read. Lists can be an important part of a web site. There are three types of lists that can be used in web design, one is an ordered list, the other is an unordered list, and finally there is a description list. Most of the time you will be using an unordered list, but it’s always good to know how to create all three of them. Let’s start with adding an ordered list under your first paragraph. In order to do this you’ll add the following code directly under your closing </p> tag. Under that we’ll go ahead and add an unordered list with the following code. You’ll notice that the only difference between the ordered and unordered lists are the opening and closing tags. The ordered list will start and end with <ol> and </ol> while and unordered list will start and end with <ul> and </ul>. Just so we can compare all three at once we’ll add the description list under the unordered list using the following code. Save your work and refresh your browser once more to see the difference between the lists. Now for something that’s always fun, adding pictures and images into your website. Instead of having just a plain old Welcome! in the header section, how about an image instead? To add images into your web page you have to use the following code. Save your work and refresh your browser once more. You should now see your image in the header section.